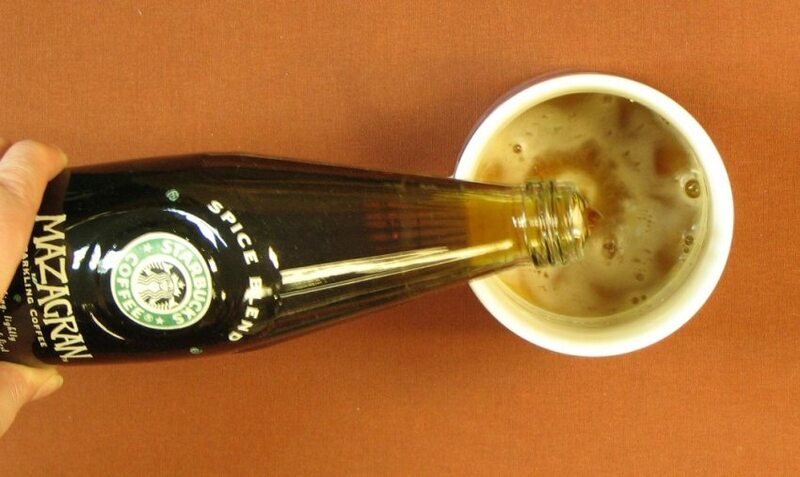 #TBT Starbucks Coffee Delivered to Your Home. “We’re not just throwing up a Web site,” CEO Schultz insists. 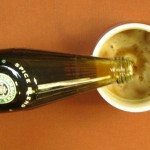 Coffee giveaway: Seattle’s Best Coffee introduces canned coffee drinks! #TBT – New Hot Paninis at Starbucks! (The chicken Santa Fe panini). You should send a bottle to the Cinema Snob. He has a feature where he tastes obscure and often out-of-date sodas. This is one of the many reasons I love this blog. I would have never known that this stuff ever existed had you not posted about it. YOU find the coolest stuff Melody! Thanks again for a wonderful thread. 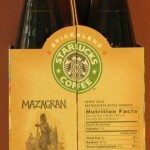 I don’t remember these drinks from those days….maybe they were here and I never noticed because I would’ve only been having brewed coffee and maybe a carmelita or lemon knot! I have to agree totally with what has been said already- what a great thread. Did not at all know about this drink. Like the name, but I sure think you were brave Melody to drink it after all those years! 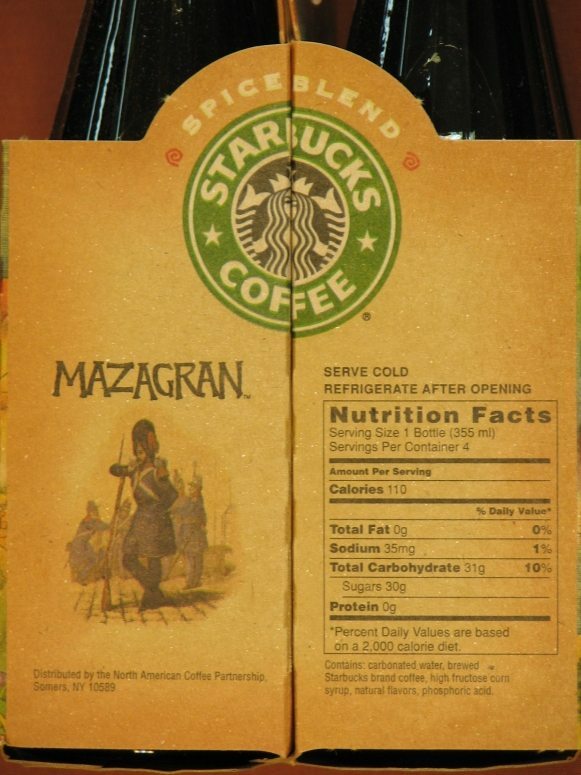 Wonder what other drinks or products are out there that SB did not stay with. Thanks again Melody. This blog rocks! Hey thanks everyone! 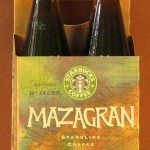 I did think it was pretty amazing luck to find a case of unopened Mazagran. 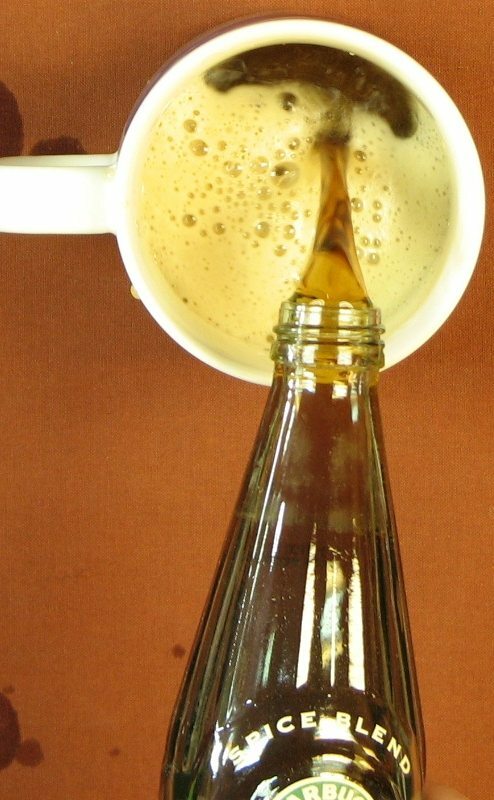 @EnlightenedCoffeeSage – I like Via with carbonated water and classic syrup. I was making that often before even there was Iced Via. But even better, is Vanilla Dry Soda (a very small brand of carbonated flavored waters) plus Via. That is amazing. That’s a great idea, to mix iced VIA and club soda. 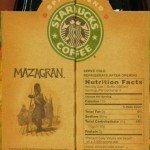 Whatever happened to when Redhook served a Starbucks coffee stout? 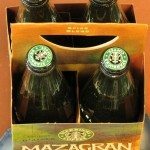 It would be cool if Roy St. and 15th Ave could serve up some Starbucks-inspired beer. I’m glad it was still bubbly! Wow, this is awesome. Because the name almost contains “grain,” I initially assumed beer. Did you try it with cream? I know it seems strange to add cream to a soda, but I really like Peligrino + 1pV (or Vanilla Bean Dry Soda) + Via + cream, almost a coffee Italian soda. Wonderful! I’m excited to see this drink. The 1st product of great developer Don Valencia of Starbucks! I want to try Iced Via with carbonated water. Thank you. Mel, I admire your experiment on a human body, your self…….. I wonder if this tastes like all the other “coffee” sodas? wow, 15 years ago I was 8 years old, and somehow I have one of these bottles. I have always kept a collection of empty soda bottles and I just check to make sure it was the same stuff and I have one of these. What did it taste like? I love the carton design. Reminds me of the old stores. Really cool to see this, thanks for sharing! Wow, what a find – and how brave of you to actually drink some. I think I first heard (or recall first hearing) about this via one of Pat Nerr’s GAS posts (or John Moore’s BrandAutopsy). 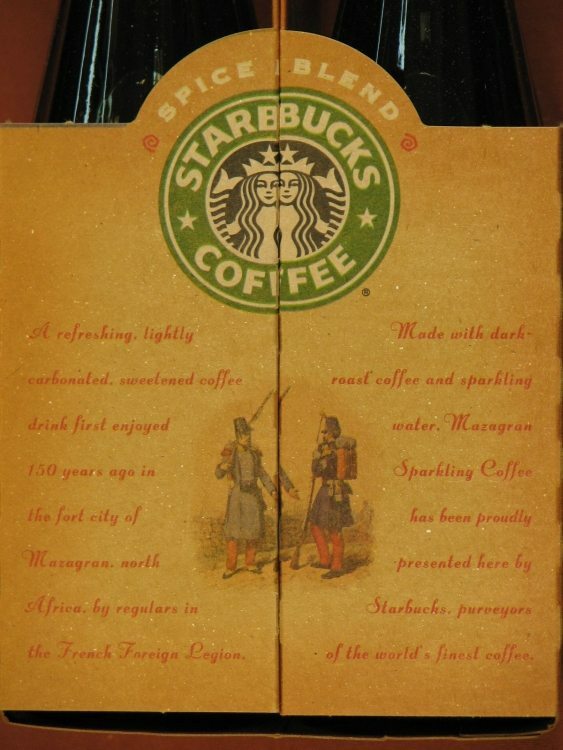 very cool…thanks for the Starbucks history lesson. I remember reading that part in ‘Pour Your Heart Into It’ so it’s cool to see what it looked like…do not remember that either…although I would have only been 16. This was so fun, Melody! It really wasn’t bad. I liked the slight spice flavor… kinda like a Chai tea but coffee. @LatteRose: one of the pictures of the bottle shows the ingredients. 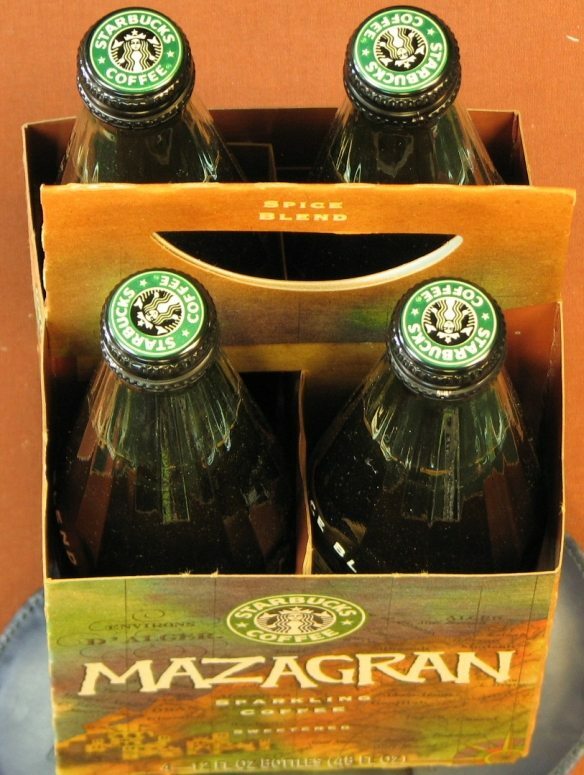 Not much there: Carbonated water, brewed Starbucks coffee, high fructose corn syrup, natural flavoring (spices)and phosphoric acid. I figured nothing in there was going to make me sick even if it was 15 years old. Loved playing the guinea pig and pushing Mel a little — hehe. I am sitting her chuckling — I am watching American Pickers on the History Channel with my right eye and am reading Melody the Starbucks Picker with my left eye. I am looking forward to reading about more of your finds–happy hunting. OK, so the packaging is beautiful, but I tried iced Via with a Pellegrino… and it was awful! Drinkable… but I won’t have it again! It tasted like flat soda. I also remember hearing about this from ‘Pour Your Heart Into It.’ Can’t wait for its counter piece next year. Way to plug the Iced Via. I keep a spare pack at my desk at all times. It’s great for on the go. 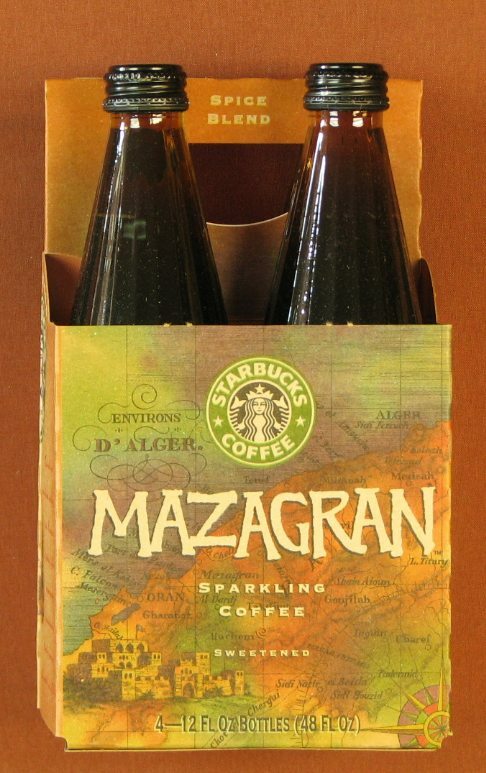 Very cool that you were able to score some Mazagran. Surprised you didn’t try it over ice the first time :). ps: you know, this is REALLY an amazing find! While we are discussing RTD&E, does anybody remember Tiazzi or tried the bottled Tazo Thrive? What the heck is a carmelita or a lemon knot? Please tell! @Molly – thanks for listing the ingredients! And the great photos too! I tried Pellegrino with Via Columbia and some vanilla syrup, and I liked it. It wasn’t the sort of thing I’d want a lot of, but I thought it was tasty. No one else shared my opinion. BSR: Can’t say I’ve ever seen either of those. What were they? I’m curious, `cause I like Tazo stuff. That would be the ideal drink sitting down with a copy of Joe Magazine. to ‘camspi’: ‘carmelitas and lemon knots’ were two of the wonderful pastries that Sbux carried in the late 80’s and thru the late 90’s. The carmelita is an actual name of a cookie-type treat, I’ve had them recently elsewhere. It’s a almost-shortbread-type cookie with a dollop of really good chocolate on top and a bit of caramel in top of that. melt in your mouth and to me, one was just excellent with a tall coffee. Same with the ‘lemon knots’ (which I think also still exist as a real cookie, somewhere)…a thicker, kind of donut shaped (but smaller) cookie, lemon flvored with a little glaze. They were both around for quite a while and sold well. Then one day, gone. I was told they changed vendors and that was that. Very very good pastry, imo. @deniseR – I had wondered what a lemon knot was too. I definitely think the pastries were much better before they started creating pastries on the scale of thousands and thousands of stores. There was like a cinnamon twist churro thing that I kind of miss. @CamSpi – I’ve never actually tried iced via with a bubbly water but I had assumed it would be good. What definitely IS good (I’ve mentioned it already) imho is Vanilla Dry with Via. And I’ve done San Pelligrino with plain Via and classic, but I need to mix that with Vanilla syrup and try it like that. 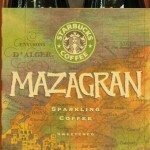 @bostonStarbucksRebel – What was Tazo Thrive? @KarlDahlquist – That was funny! I’ve been trying to get my hands on a copy of Joe Magazine. I remember reading a news interview once that Howard keeps several copies of Joe Magazine in his office. That’s the only place that I know of that has it! I just want badly to borrow one from Howard. hahaha! I believe in Japan not-fresh coffee beverages (bottled, powdered) are a huge market. 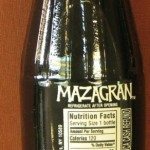 So there are probably similar items to Mazagran out there – but the US market these are not worth it – now if those companies could just ship and share some of the Japanese items with us, skip translation I think there be an insane little niche market. Your link were enough to make me laugh. Thank you! @Nob Nope, no stomach ache. But I didn’t drink the whole bottle. Just a few inches. @DeniseR That’s totally interesting. In my mind, I forever think of the Schwartz Bros. bakery as supplying all the baked goods. I’m not even sure which era that was. @Baroosta – Thanks! I thought it was pretty incredible luck! Wow! Melody, drinking that 15 year old brew is quite brave of you! You truly are dedicated to everything Starbucks. I’m glad you felt fine after it. Also, I appreciate this history lesson! I read about the drink in Howard’s book, but didn’t know what it looked like; your pictures are great. The bottle is really nice and I hope you keep it forever. Look forward to more history lessons! did you keep the bottle cap?! it could make an awesome necklace! 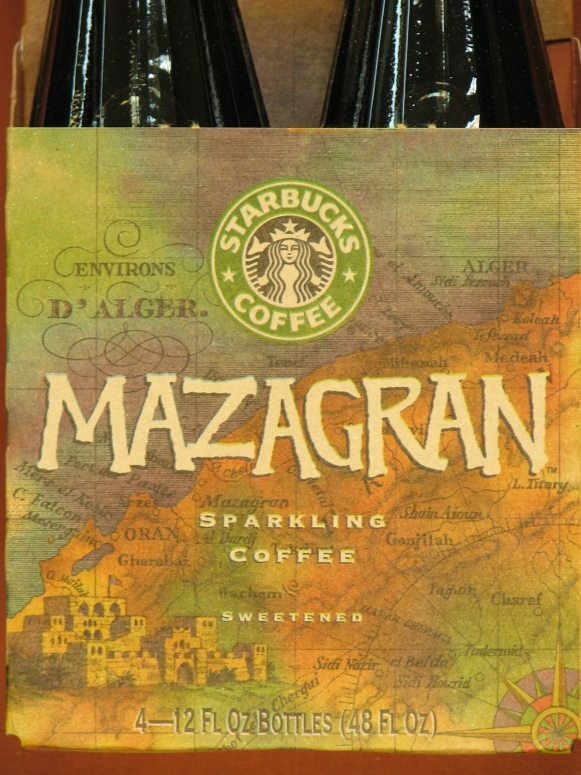 Ah, Mazagran! I remember it when Starbucks was bearly starting. I could kick myself for not trying it. I don’t know why its a failed drink. I say they should bring it back, repackage it 9tho that packing is cute) , remarket it , rename it , even. Back then , energy dirnks were almost unheard of . 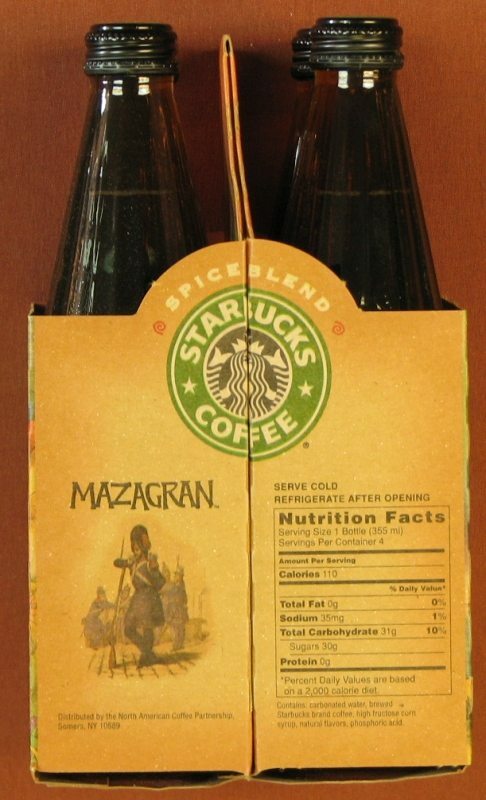 Today, not only are energy drinks all the rage, Starbucks is still going strong. It would be a nice alternative to the medicine-ny tasting drinks out there, but with the coffee kick. Sorry for all typos cool site. re: these bottle caps. I don’t remember where I read this (maybe in REAL SIMPLE magazine?) but someone suggested adding a little magnet with glue to the back of bottle caps and they make cool little magnets for the ‘fridge or wherever. Thanks for the picture Nob! you sure can find coffee everywhere out there 🙂 are the canned coffees any good? or are they like our instant coffee dispensers here and are sad tasting? 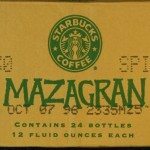 I tried reproduction of Mazagran, by carbonated water and Starbucks iced coffee VIA. I needed time to look for words to describe it after drinking it. In my past life, it was the first taste. The hard disk in my head raised the considerably big noise for the difficult search. lick the candy and drink Budweiser, I think the taste is it. The kind is very abundant. It seems American hamburger. Excellent, yum, so so, not bad, hell. Haha. I think that the Japanese RTD coffee market is strange. Wow, Melody, that Mazagran is too cool! I’m surprised you were able to find some unopened—and good for you for being brave enough to taste it! 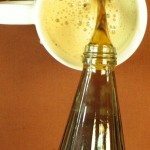 I’m going to try your vanilla Dry soda + Via concoction next time I’m at the grocery store. I think I’d like it, and if not, I’ll at least be glad I tried it. 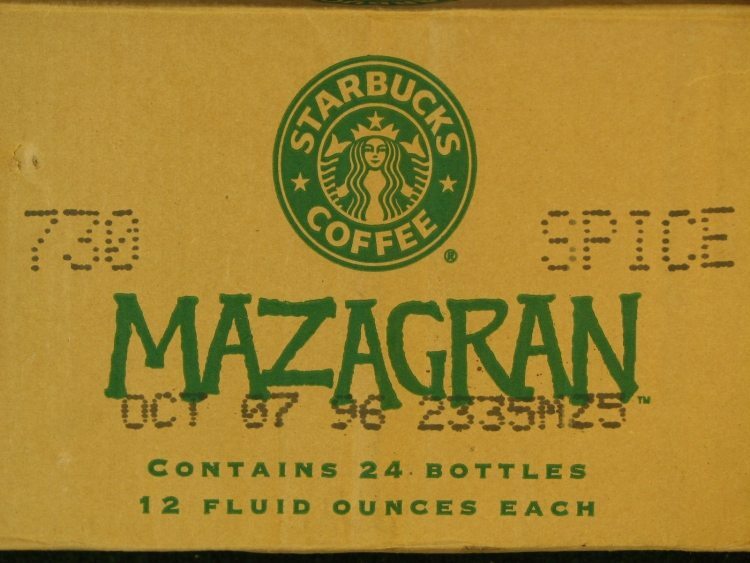 Of all the Starbucks collectibles out there, unopened Mazagran is probably the most intriguing I’ve heard of. 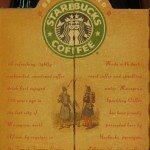 Come on, let’s petition Starbucks to bring it back!! Doke Black tried but failed. 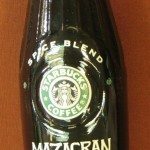 When I first bought it, the nosey clerk told me “oo, I tried that , it tastes like vanilla!” So, the vanilla taste was embedded in my brain and I never got to taste the coffee in ti . Thanks clerk from K-mart! I meant to say Coke Black. Oops!